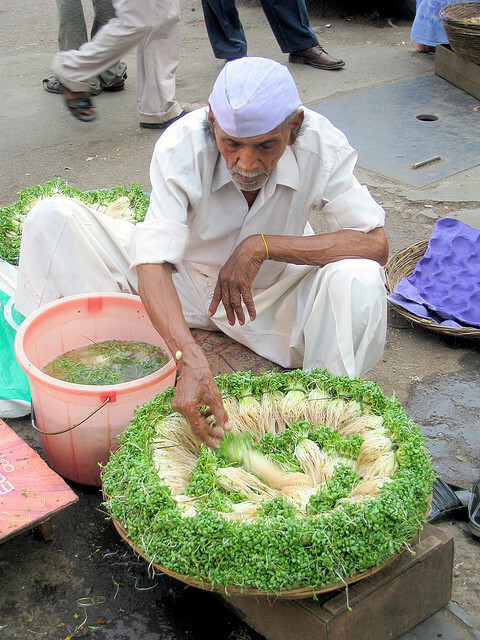 For years Iv walked past vegetable vendors selling this queer looking vegetable and wondered what it could be! Make a paste of the garlic and green chilies. When everything is a little brown and cooked add the washed and cut sagar methi. Add salt. Let it cook for 5-10 minutes . Then add fresh grated coconut. Let it cook for another 5-7 minutes. In the end add a generous squeeze of lemon juice ....this cuts out the bitterness of the methi. as usual i am impressed with your recipes. they are easy and YMMMMMMMMMMMMMMY ! bless you and keep it up. Love that first photograph. A lovely candid picture with perfect lighting.